Great Lakes Helicopter Inc. is a helicopter pilot training school based in the Waterloo Regional Airport (Ontario). Great Lakes Helicopter is a Transport Canada approved, Ontario Private Career College Flight Training School and Charter company with more than 20 years of existence. Great Lakes Helicopter had enjoyed major success through traditional means of marketing, however, due to changes in city regulations they were now unable to attract as many students as before. Fortunately for them, their website was ranking highly for almost any term associated with their services all over the world, but conversions weren't happening. They needed a new web design but also were afraid of loosing their rankings and traffic. 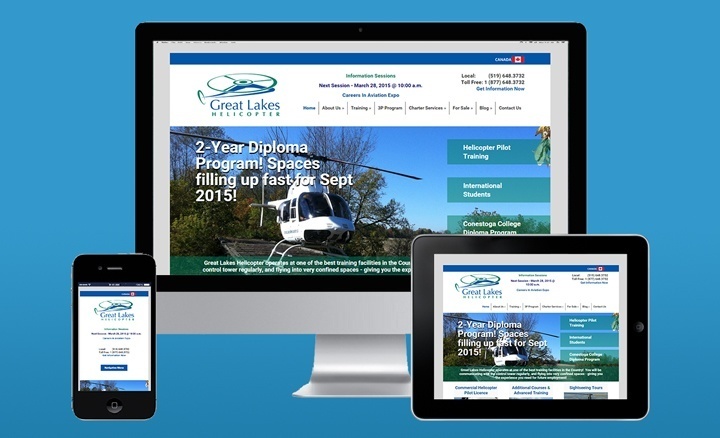 We where approached by Great Lakes Helicopter to improve their conversions. At the time, their design was outdated and their website was missing vital information that prospective students were looking for. Our priority was to create a structure that would allow users to easily find all the information they needed to jump into a career in aviation, so they could take this important decision and retain or improve the school's Google rankings. A web design reboot was what they needed. The big challenge was to update the website and change the information structure without affecting their fantastic rankings in Google and other search engines. We restructured the information on their website and rewrote most of the content as well as created a navigation structure that was easy to navigate and was visually appealing. Along with the redesign, a series of short videos explaining the information on key pages and presenting each of the instructors and staff at Great Lakes were commissioned. The results were immediate. During the first 3 months the increase in conversion rate (the number of contacts divided by the number of visitors to the website) increased a 39.6%, leading to an increase in student registrations. Not only did sales increased, the rankings improved across the board. More impressive yet, as an experiment, Great Lakes Helicopter marketing manager created a landing page promoting the sale of a helicopter. It was sold within a month!